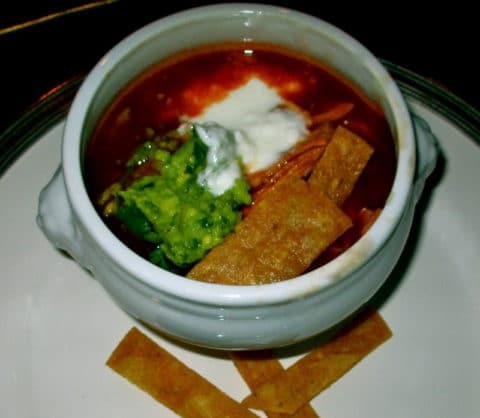 Chelsea was given a crock pot when she went away to college and then found this easy tortilla soup recipe that she always makes for her friends. I made it the other night and everyone wanted the recipe. Here it is! Put all ingredients in the crock pot and cook on low for 10 hours or high for 6 hours. Remove chicken, shred meat and return to pot. Serve with cilantro, sour cream, jalapenos, guacamole and tortilla strips. I call this ‘5 canned soup’,and serve it in a pinch or at the end of the month. Try adding 1/2 a can of hominy. It’s easy to freeze the other 1/2 in a zip lock freezer bag, until next time. So easy!!! I Can’t believe there is no chopping and it turns out so delicious! This is a great recipe for anytime! !